This is part of the ‘It Takes a Thief’ Blogathon being run by Debra over at Moon in Gemini. My Take on it – This is a film that I have been curious to see ever since I saw Robert Besson’s A Man Escaped (1956) a few months ago. Being that I’m not usually the biggest fan of foreign language films, I kept pushing this off until I decided to use it as my entry in Debra’s blogathon. Boy was this a great choice since it is fascinating to watch. 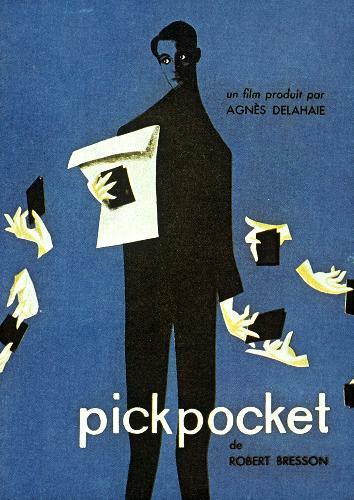 This film depicts the art of pick-pocketing in such a way that we get to watch so much slight of hand as characters easily use their dexterous hands in unbelievable ways in order to commit the crime of thievery. The way the movie was filmed helps us understand the main character’s life and motivations so much easier and we actually can sympathize with his choices even if we might question them from a moral standpoint. This film is almost entirely told via narration which leads to minimal dialogue between the characters along the way. This actually helps the viewer feel more of a connection to the character and despite his desire to steal from others, we still want him to find a way to succeed in his life. The runtime of this film is a neat 75 minutes which helps keep things interesting to the viewer for the entire time. I guess I’ll have to try and find the time and inclination to see more of Besson’s films in the future. Bottom Line – Amazingly shot film because it allows us to try and understand what the main character’s motives are and how he learned his new profession. The visuals are unbelievable to watch because we get to see how this trade works so well due to quick and dexterous hand motions. The lack of dialogue coupled with mostly narration helps us connect with the main character even more. Highly Recommended! Thanks so much for your contribution to the blogathon!